The salt stress affects plant growth and physiological characteristics during early growth stages in rice (Oryza sativa L.) The objective of this study was to examine the influence of salt stress on rice growth during early stages and to find out their salt tolerance levels. A pot culture experiment was conducted in rice cropping season 2016, with completely randomized design (CRD) and three replicates. The treatments were two rice cultivars, 'Liangyoupeijiu' (LYP9) and 'Nipponbare' (NPBA) with four salt stress levels 0 (control, CK), 1.5 (low salt stress, LS), 4.5 (medium salt stress, MS), and 7.5 g (heavy salt stress, HS) NaCl kg-1 soil at different growth stages with six seedlings per pot. About 15 parameters were recorded and most of the treatments were significantly different (P < 0.05) from each other. The results showed that salt stress reduced seed emergence characteristics of the rice. It also decreased photosynthetic parameters, growth characteristics including DM, and seedling height reduction increased at early seedling and maximum tillering stage in both rice cultivars but this disaster is less in 'LYP9' than 'NPBA'. On the basis of DM reduction, 'LYP9' was categorized as moderately susceptible (MS) and susceptible (S) at HS during early growth stage, and 'NPBA' was categorized as sensitive to the HS stress level. The result suggested that 'LYP9' showed somehow resistance under salt stress than 'NPBA'. This study will help us to provide new ideas for improving the high yielding rice cultivar (LYP9) to salt tolerance by genetic modification and cultivation techniques. Salt stress is one of the main growth reducing abiotic factors for most of the plant species. The low and excessive level of salt about threshold level of plants reduced plant growth characteristics, yield, and ultimately plant death (Darwish et al., 2009). In the arid to semi-arid regions of the world, high temperature and water shortage regularly cause salinity problem that bound or hinder staple crop productivity including rice (Nachimuthu et al., 2017). These stresses affect major plant mechanisms, such as photosynthesis, transpiration rate, water conductance, cellular metabolism, and plant DM partitioning (Newell, 2013). It is estimated that 20% of irrigated land is affected by soil salt stress, decreasing crop production (Kader and Lindberg, 2010). After exposure to salt stress, the crop plants are faced with osmotic stress, oxidative stress, ion toxicity, nutritional imbalance, as well as growth stages at which plant subjected to salt stress (Darwish et al., 2009; Habib et al., 2010). The sensitivity of numerous plant species differs at seed germination, early seedling growth, and advance growth stages with respect to salt stress (Mokhtar et al., 2015). In some plant species, early growth stages are most precarious as advance growth and developmental stages, and yield depends on active seed germination and seedling growth (Hakim et al., 2010). Under salt stress environment, seed germination attitude differs from plant species to species and also a significant variation is observed within the cultivars (Munns and Tester, 2008). Rice (Oryza sativa L.) is ranked as a salt-sensitive crop than other important cereal crops such as wheat and maize (Joseph et al., 2010). The morphological characteristics of rice plant are severely influenced by salt stress (Zhang et al., 2012). The rice crop falls in the sensitive division from 0 to 8 dS m-1 by the taxonomy of crop tolerance to salt stress (Maas, 1986). While the threshold level for salt tolerance is 3 dS m-1 in rice with increasing 1 unit of electrical conductivity (EC, dS m-1), 12% yield reduction occurs (Maas and Hoffman, 1977). It is a moderately salt sensitive crop and its sensitivity or susceptibility varies from species to species and growth stages. In rice, the early seedling stage is among the most sensitive stages to salt stress, and studies on this stage could undoubtedly provide a base for improving tolerance through the life cycle of the plant (Munns and Tester, 2008). Furthermore, the concentration of Na+ in plant tissue is negatively linked with plants growth and productivity, and shoots growth effects more than root growth (Jiang et al., 2010). Final germination percentage is positively correlated with the dry weight of germinated seedling at transplanting, as well as with biomass production during salt stress (Hakim et al., 2010). Salt stress decreased plant biomass, and this is due to the reduction in carbohydrate formation caused by a decrease in C assimilation (Pattanagul and Thitisaksakul, 2008). Salt stress not only affects germination and plant growth, but also severely impact on photosynthetic activities in the rice leaves, such as decreased chloroplast activity, reduced photosynthetic rate (Pn), transpiration rate (Tr), water conductance (gs), and intercellular CO2 concentration (Ci) (Teixeira and Pereira, 2007). 'Liangyoupeijiu' (LPY9) has a good grain quality and high yielding (Lu and Zou, 2016), but the responses to salt stress are not reported yet about this cultivar. To successfully cultivate 'LPY9' at large-scale, future studies for the hazardous growth conditions such as salt stress and the cultivation techniques are necessary. It is very important to classify the tolerance and sensitivity level of cultivars during germination, early seedling, and maximum tillering stage growth for effective crop yield in salt affected conditions. Therefore, the main objective of this experiment was to examine the influence of salt stress on growth and physiological performance of rice during early stages and to find out their salt tolerance levels. A pot culture experiment was conducted in greenhouse at China National Rice Research Institute (31°4'49" N, 119°56'11" E), Zhejiang Province, China, during rice crop season (May-November) 2016. The site is in the northern subtropical humid climate zone, with an annual temperature range of 1.1-33.9 °C and average rainfall of 200.7 mm. The experimental soil was loamy clay: 1.120 g cm-3 bulk density, 4.7% organic matter, 0.0864 dS m-1 electrical conductivity (EC), and 5.95 pH. Two rice cultivars were used as planting material, Liangyoupeijiu (LYP9, indica), a high yielding hybrid with 10.5 t ha-1 yield potential and among the first or second ranked high-quality rice cultivars in China (Katsura et al., 2007), and Nipponbare (NPBA, japónica, sensitive to salt stress). For seed emergence or early seedling trial, 50 seeds were sown per pot (45 x 30 cm) on 4 June 2016, and the pots were filled with 23 kg air-dried loam clay soil. For the maximum tillering trial, normally grown seedlings of both cultivars were transplanted on 23 June 2016, in pots (45 x 30 cm) filled with 23 kg air-dried loam clay soil. Six 30 d-old seedlings of each cultivar per pot with three replicates were used. Synthetic salt stress was developed by adding salt sodium chloride (NaCl) in pots to develop EC in the soil. Four levels of NaCl: 0 (control, CK), 1.5 g NaCl kg-1 dry soil (low salt stress, LS), 4.5 g NaCl kg-1 dry soil (medium salt stress, MS), and 7.5 g NaCl kg-1 dry soil (heavy salt stress, HS) were mixed with dry soil before sowing seeds and transplanting rice seedlings in seed emergence or early seedling and maximum tillering experiment. The corresponding EC for these treatments was 0.0864 (CK), 1.0894 (LS), 3.2 (MS), and 4.64 dS m-1 (HS). The time frame from emergence to the maximum tillering stage of the crop growth is given in Table 1. Nitrogen was applied in the form of urea (N 46%), P was used as superphosphate (P2O5 12%) and K was used as potassium sulfate (K2O 54%). The urea was used at 4.02 g pot-1 in two splits, 50% was applied as basal dose and 50% at tillering stage. All superphosphate (6.93 g pot-1) was applied as basal dose. Potassium sulfate (3.08 g pot-1) was applied in two splits, 50% basally and 50% at tillering stage. Table 1 Crop growth data. In seed emergence or early seedling trial, 12 d rice seedlings were harvested and 20 plants from each treatment were collected. Rice plant height, root length (after careful washing), and plant DM were determined. From the maximum tillering stage experiment, three plants were collected from each treatment to evaluate plant height, root length, root DM, leaf DM, and shoot DM at the maximum tillering stage. In seed emergence or early growth trial, after exposure of salt stress, 12 d seedlings were harvested. Root length and shoot length of rice seedlings from each treatment were measured at the time of harvest with a length measuring scale. Total dry weight from 20 seedlings was recorded after oven drying at 105 °C for 30 min and then 85 °C for 24 h till constant weight. For the maximum tillering trial, three plants were harvested from each treatment and measured plant height and root length. We also measured leaf, root, and shoot DM after oven dried till constant weight. Normally grown 30 d-old seedlings were transplanted under different salt treatments. After transplanting the seedlings, numbers of tillers were counted from each pot after 7 d till maximum tillering stage and find the tillering dynamics under different salt stress levels. Leaf area of the plant was measured at the maximum tillering stage. Three plant samples from each treatment were collected and all leaves were separated from plant and leaf area was measured by leaf area meter (LI-3100 Core Area Meter, LI-COR, Lincoln, Nebraska, USA). The plant physiological parameters, transpiration rate (Tr), net photosynthesis (Pn), stomatal conductance (gs), relative humidity (RH-S), and intercellular CO2 concentration (Ci) of the flag leaves were recorded from 10 d after transplanting to the maximum tillering stage at 15 d intervals. The observations were recorded in sunny days between 09:00 and 11:30 h by portable photosynthesis system LI-6400XT (LI-COR). At the time of data recording, the CO2 concentration in the leaf chamber was controlled by 400 Limol mol-1, temperature was 30 °C, and light intensity was 1500 Limol m-2 s-1. Chlorophyll values (SPAD values) were also measured by selecting rice flag leaves, the second and third leaves from the top, every 10 d interval after transplanting to the maximum tillering stage by using chlorophyll meter (SPAD-502 plus). To find out their salt tolerance levels, cultivars were categorized based on total DM reduction due to implementation of salt stress levels as tolerant (T = 0%-20% reduction), moderately tolerant (MT = 21%-41% reduction), moderately susceptible (MS = 41%-60% reduction) and susceptible (S = > 60% reduction) (Fageria, 1985). A completely randomized design (CRD) was used in this experiment. The statistical analysis of the data was performed with software package SPSS Statistics 19.0 (IBM, Armonk, New York, USA). The data was accomplished by one way ANOVA and mean values were compared by Duncan's least significant difference (LSD) at the 5% level of significance. Excel 2010 was used for graphical presentation. In the current study, seed emergence rate (SER) was significantly reduced as the salt stress accelerated. Regardless of cultivars, maximum SER was recorded at the control and the lowest SER was recorded at HS treatment in LYP9 and NPBA. Generally, LYP9 showed the better SER than NPBA at all salt stress levels. SER was lower at LS, MS, and HS in both cultivars than CK. With the increased of salt stress levels, SER in LYP9 was decreased by 7.83%, 67.35%, 83.67% at LS, MS, and HS, respectively, as compared to CK. In NBPA, SER was also decreased by 15.19%, 72.98%, and 89.13% at LS, MS, and HS, respectively, as compared to CK (Figure 1a). At heavy salt stress, seedling emergence was totally inhibited for NPBA than LYP9. Final emergence percentage (FEP) was inversely linked to salt stress levels. Generally, the FEP was considerably reduced in both cultivars due to accelerating salt stress levels (Figure 1b). At the LS level, 97% of FEP was observed from the LYP9 and 87.67% in NPBA. At the MS salt stress level, a higher FEP of 19% was observed from the LYP9 and 11.33% in NPBA. At the HS salt stress level, a higher FEP of 7% was observed from the LYP9 while NPBA could not survive at this salt stress level. The lowest FEP < 10% was observed for the NPBA cultivar (Figure 1b). Though, cultivars variations were noticeable at HS salt level. Significantly, highest FEP was observed in LYP9 than NPBA. Amongst the both tried cultivars, LYP9 was superior in seed emergence at HS as compared to salt sensitive cv. NPBA. Seed emergence energy percentage was observed at 4, 8, and 12 d after sowing of seed to harvesting and variation in both cultivars were observed in relation to SEEP under salt stress conditions. With the increased NaCl levels, SEEP was significantly decreased with the passage of time (Figure 1c). The SEEP at 4th day after sowing from CK, LS, MS, and HS was recorded as 93%, 63%, 27%, and 14% in LYP9 and 99%, 75%, 23%, and 12.67% in NPBA, respectively. The SEEP at 8th day after sowing from CK, LS, MS, and HS was recorded as 100%, 89%, 33%, and 11% in LYP9, and 100%, 85%, 25%, and 4.67% in NPBA, respectively. While The SEEP at 12th day after sowing from CK, LS, MS, and HS was recorded as 100%, 97%, 19%, and 7% in LYP9, and 100%, 84.67%, 11.33%, and 0% in NPBA, respectively. During the early growth period, SEEP from the first 4 d was higher in both cultivars, especially in NPBA at CK, and LS, but SEEP for NPBA was lower at MS and HS treatment than LYP9. With a time of salt exposure from 8th day to 12th day, SEEP was decreased significantly as compared to control. The SEEP at 12th day was zero at HS treatment in NPBA. Bars denoted mean values ± SE (n = 3). Results are significantly different (p ( 0.05) according to LSD test. CK: Control, LS: low salt stress, MS: medium salt stress, HS: heavy salt stress, LYP: 'Liangyoupeijiu', NPBA: 'Nipponbare'. 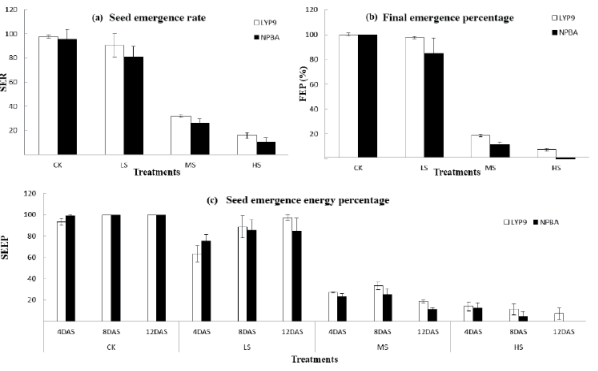 Figure 1 Effect of sodium chloride on (a) seed emergence rate (SER), (b) final emergence percentage (FEP), and (c) seed emergence energy percentage (SEEP %) in rice cultivars. Effect of salt stress on growth characteristics varies from species to species and within species of plant. In this trial, plant growth was affected with increased salt stress levels. Root, shoot length, and total plant DM were significantly reduced under LS, MS, and HS in both cultivars, respectively. Root length decreased by 23.4%, 43.8%, and 53.1% under LS, MS, and HS respectively compared with CK in LYP9. For NPBA, root length decreased by 21.6%, 47.1%, 100% under LS and HS respectively than CK. At heavy salt stress NPBA could not survive. Similarly, shoot length decreased 31.2%, 52.4%, and 63% under LS, MS, and, HS respectively than CK in LYP9. For NPBA, the shoot length decreased by 31.5%, 63.4%, and 100% under LS, MS, and HS compared with CK. These results show the high sensitivity of NPBA as compared to LYP9 and these variations based on their genetic variability against salt stress (Figure 2). Dry matter production was also affected due to increased salt stress in rice. Total DM production was significantly decreased under salt stress levels compared with control. The total plant DMwas decreased by 22.1%, 59.7%, and 85.2% under LS, MS, and HS, respectively than CK in LYP9. Total DM production was also significantly decreased in NPBA by 24.6%, 75.5%, and 100% compared with CK. Total plant DM production is very important to interpret the yield of the rice crop (Table 2). 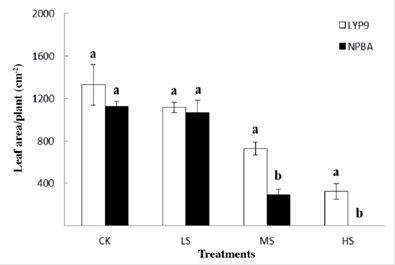 Figure 2 Effects of NaCl on the morphology of rice plant at the early seedlings stage. Table 2 NaCl affects growth characteristics at early seedlings stage. Values are denoted as mean ± SE (n = 3).Values followed by different letters are significantly different (p ( 0.05) according to LSD test. CK: Control, LS: low salt stress, MS: medium salt stress, HS: heavy salt stress, LYP9: 'Liangyoupeijiu', NPBA: 'Nipponbare'. Photosynthesis activities at maximum tillering stage. Generally, net photosynthesis (Pn), transpiration rate (Tr), relative humidity in the sample (RH-S), stomatal conductance (gs), intercellular CO2 concentration (Ci), and values of rice flag leaves for LYP9 and NPBA were decreased at maximum tillering stage with increasing salt stress levels (Table 3). For LYP9, the average values of the Pn, Tr, RH-S, gs, and Ci of rice flag leaves were 7.1%, 11.5%, 12.7%, and 6.8%, 25%, 32.4%, and 11.6%, 19.1%, 28.0%, and 14.3%, 35.7%, 50%, and 4.1%, 7.1%, 11.5% respectively lower at LS, MS, and HS than CK. The photosynthesis activities of rice flag leaves for LYP9 showed nonsignificant differences in CK, LS, HS, but decreased their values, which may be ascribed to the genetic characteristics of LYP9 to salt stress. NPBA is sensitive to salt stress, Pn, Tr, RH-S, gs, and Ci values of rice flag leaves were significantly decreased at the maximum tillering stage. For NPBA, the mean values of the Pn, Tr, RH-S, gs, and Ci of rice flag leaves were declined by 1%, 1.4%, and 10%, 26.4%, and 2.6%, 8.3%, and 40%, 50%, and 2.3%, 9.7% respectively lower at LS, and MS than CK. While NPBA seedlings could not survive at heavy salt stress. This indicated that NPBA is a highly sensitive cultivar. Overall values of the Pn, Tr, RH-S, gs, and Ci values of rice flag leaves were less in NPBA than LYP9. These variations may be due to the internal genetic mechanism of cultivars and high sensitivity of NPBA to salt stress. Table 3 Effect of NaCl on photosynthesis activities. Values are denoted as mean ± SE (n = 3). Values followed by different letters are significantly different (p ( 0.05) according to LSD test. CK: Control, LS: low salt stress, MS: medium salt stress, HS: heavy salt stress, LYP9: 'Liangyoupeijiu', NPBA: 'Nipponbare', Pn: net photosynthesis rate, Tr: transpiration rate, RH-S: relative humidity of plant sample, gs: stomatal conductance, Ci: intracellular CO2 concentration. SPAD values in rice flag leaves were decreased with increasing salt stress levels in both LYP9 and NPBA (Figure 3). Results may be suggested that salt stress enhanced the degradation of chlorophyll in flag leaves of rice. The SPAD values at the maximum tillering stage in LYP9 under salt stress was 9.8%, 12.7%, and 16.1%, respectively, and was decreased with increasing salt stress level from LS to HS than CK. While in NPBA, the SPAD values at the maximum tillering stage under salt stress was from 6% to 8%, respectively, and was decreased with increasing salt stress level from LS to HS than CK. The differing in SPAD values for NPBA than LYP9 may be attributed to the intrinsic factors of these cultivars. These results supported that salt stress had significant effects on senescence of flag leaves. Imposition of NaCl in the soil caused reduction of a number of tillers per plant. The number of tillers effects with increasing salt stress levels from control to heavy salt stress in both cultivars. The maximum number of tillers under CK, LS, MS, and HS as 11, 10, 8, and 6 were recorded respectively for LYP9, and 10, 9, and 7 for CK, LS, and MS for NPBA but at seedlings for HS treatment in NPBA could not survive. This variation depends on their sensitivity of NPBA and genetic makeup of LYP9 (Figures 4a and b). Salt stress badly affected the leaf area in rice cultivars with an escalation in the concentration of salt. To compare with CK at rice maximum tillering stage, the leaf area in LYP9 was decreased by 16.2%, 45.2%, and 75.8% with increased salt stress level from LS to HS, respectively. While in NPBA, at the maximum tillering stage the leaf area under salt stress was decreased by 5.4% and 74.4% with increased salt stress level from LS to HS than control (CK) (Figure 5). NPBA seedlings could not survive under heavy salt stress (HS). These variations are due to the internal genetic mechanism of both cultivars and high sensitivity for the salt stress of NPBA. The reason is that low Pn, gs, Tr, and low chlorophyll contents values affect plant leaf area. Salt stress caused leaf senescence which causes reduce canopy of the rice plant. Bars denoted mean values ± SE (n = 4). Values followed by different letters are significantly different (p ( 0.05) according to LSD test. CK: Control, LS: low salt stress, MS: medium salt stress, HS: heavy salt stress, LYP9: 'Liangyoupeijiu', NPBA: 'Nipponbare'. Figure 3 Effect of NaCl on SPAD values of rice cultivars. Salt stress reduced plant height and root length as well as DM contents of leaf, stem, root, and total DM (Table 4). The leaf, stem, root, and total DM, and plant height and root length were decreased with increasing salt stress in Liangyoupeijiu and Nipponbare rice cultivars. In LYP9, salt stress reduced root length, plant height, leaf, stem, root, total DM by 3.1%, 15%, 34.9%, and 2.1%, 22.7%, 40.9%, and 13.9%, 45.5%, 78%, and 27.9%, 60.7%, 86.1%, and 42.1%, 76.4%, 90.6%, and 22.1%, 59.7%, 85.2% under LS, MS, and HS salt stress, respectively, at maximum tillering stage than control (CK). In NPBA, salt stress reduced root length, plant height, leaf, stem, root, total DM by 1.2%, 45.4%, 100%, and 1.1%, 27.7%, 100%, and 14.4%, 66.3%, 100%, and 30.4%, 79.8%, 100%, and 1%, 67.6%, 100%, and 24.6%, 75.5%, 100%, under LS, MS, and HS salt stress, respectively, at maximum tillering stage than control (CK). This reducing effect depends on their sensitivity of NPBA and genetic makeup of LYP9. CK: Control, LS: low salt stress, MS: medium salt stress, HS: heavy salt stress; LYP9: 'Liangyoupeijiu' (a), NPBA: 'Nipponbare' (b). Figure 4 Effect of NaCl on rice tillering dynamics. Bars denoted mean values ± SE (n = 3). Values followed by different letters are significantly different (p ( 0.05) according to LSD test. CK: Control, LS: low salt stress, MS: medium salt stress, HS: heavy salt stress; LYP9: 'Liangyoupeijiu', NPBA: 'Nipponbare'. Figure 5 Effect of NaCl on leaf area. Table 4 NaCl affects growth characteristics at maximum tillering stage. CK: Control, LS: low salt stress, MS: medium salt stress, HS: heavy salt stress, LYP9: 'Liangyoupeijiu', NPBA: 'Nipponbare', DM: dry matter. The rice root and shoot length decreased as salt concentration increased from control (CK) to low salt stress (LS), medium salt stress (MS), and heavy salt stress (HS). The seedling height reduction rate (SHR %) of rice plant at the early seedling stage and maximum tillering stage significantly increased as salt levels increased at both early seedlings growth and maximum tillering stage of rice cvs. LYP9 and NPBA (Figures 6a and b). In LYP9, the SHR % increased by 47%, 111%, 170%, and 2.1%, 29.4%, 70.3% with increased salt stress levels from LS, MS, and HS salt stress levels, respectively, at early seedlings stage and maximum tillering stage as compared to control (CK). The SHR % is higher at early seedling stage than the maximum tillering stage. In the case of NPBA, the SHR % was significantly increased by 48% and 179% at the early seedling stage, and 1.2% and 39.8% at the maximum tillering stage under LS and MS salt stress levels as compared to control (CK). NPBA could not survive at heavy salt stress (HS). NPBA also shows higher sensitivity at early seedling stage than the maximum tillering stage. Salt stress reduced the plant emergence, seedling density and ultimately totals plant dry weight. Rice root and shoot dry weight decreased as salt concentration increased from control to low salt stress, medium salt stress, and heavy salt stress. The relative dry weight of rice plant at the early seedling stage and maximum tillering stage decreased as salt levels increased at both early seedlings growth and maximum tillering stage of rice cvs. LYP9 and NPBA (Figures 7a, b). In LYP9, RDW % significantly reduced by 80%, 56%, 41%, and 77.9%, 40.3%, and 14.8%, respectively, under LS, MS, and HS salt stress levels at early seedlings stage and maximum tillering stage as compared to CK. The RDW % is higher at early seedling stage than the maximum tillering stage. In the case of NPBA, the RDW % was decreased by 93% and 39% at the early seedling stage, and 75.4% and 24.5% at the maximum tillering stage under LS and MS salt stress levels as compared to CK. NPBA could not survive at HS stress. NPBA also shows higher sensitivity at early seedling stage than the maximum tillering stage (Figures 8 and 9). Bars denoted mean values ± SE (n = 6). Values followed by different letters are significantly different (p ( 0.05) according to LSD test. CK: Control, LS: low salt stress, MS: medium salt stress, HS: heavy salt stress, LYP9: 'Liangyoupeijiu', NPBA: 'Nipponbare'. Figure 6 Effects of NaCl on seedlings height reduction at early seedling stage (Early SS) and maximum tillering stage (Max. TS). Figure 7 Effect NaCl on relative dry weight at early seedling stage (Early SS) and maximum tillering stage (Max. TS). Figure 8 Effects of NaCl on the morphology of rice plant at the maximum tillering stage. Figure 9 Effects of NaCl on rice plant height at the maximum tillering stage. Rice cultivars showed a variation on salt tolerant above accumulative salt stress levels on the basis of total DM production (Table 5). At 1 dS m-1 EC or 1.5 g NaCl kg-1 soil (LS), both cvs. 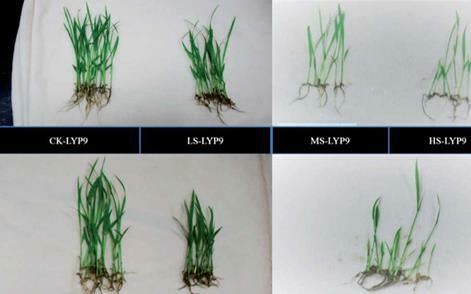 LYP9 and NPBA were salt tolerant (T) at emergence stage. While at this salt stress level these cultivars were moderately tolerant (MT) at the maximum tillering stage. However, salt levels augmented at 3.2 dS m-1 or 4.5 g NaCl kg-1 soil (MS) as both cultivars showed regular deviance from their former salt tolerant classification tolerant (T) to moderately susceptible (MS) and T to susceptible (S), respectively, at emergence stage. While at this salt stress level LYP9 and NPBA were deviated from MT to MS at the maximum tillering stage. While at 4.64 dS m-1 or 7.5 g NaCl kg-1 soil (HS), LYP9 and NPBA were MS and sensitive to salt at emergence or early stage. On the other hand at the maximum tillering stage, LYP9 was categorized as S and NPBA as sensitive to salt stress. From these results, it is clear that response of LYP9 varied with growth stages (Table 5). It is T and MT at emergence or early and maximum tillering stage under 1 dS m-1 respectively. At 3.2 dS m-1, LYP9 is MS at emergence or early and maximum tillering stage. However, at 4.64 dS m-1, LYP9 is MS and S at emergence or early and maximum tillering stage. We can suggest that it is more tolerant at emergence or early stage than the maximum tillering stage as compared to NPBA. Rice is salt sensitive among the monocot crops and its growth and yield are severely affected by the increase of soluble salts in soils (Ashraf, 2009). Imposition of salt stress during early growth period, rice faces osmotic stress, and decrease leaf growth, while during long-term salt stress, rice plants experience (Na+ and Cl-) ionic stress, and lead to early senescence of older leaves and photosynthetic area (Amirjani, 2011). Salt stress inhibits rice plant growth, such as decreasing net CO2 assimilation rate, leaf growth, leaf cell enlargement, DM accumulation (Amirjani, 2010). Its response to salt stress is complex and depends on the type of salt stress, duration of salt exposure, growth stages of rice. Rice is more sensitive to salt stress at the early seedling stage as compared with tillering stage (Shereen et al., 2011). Salt stress declined rice growth and development rate, affects physiological characteristics and reduced the water and nutrients up taking ability (Munns et al., 2006). In this experiment, rice growth characteristics are negatively affected due to salt stress at emergence, early seedlings as well as the maximum tillering stage of the rice plant. A reduction in seed emergence energy percentage, emergence rate, and final emergence percentage was experienced after exposed to increased salt stress levels (Figure 1). A reduction in seed emergence energy percentage (SEEP), seed emergence rate (SER), and final emergence percentage (FEP) was experienced after exposed to increased salt stress levels (Figure 1). Rice seed emergence or early seedlings growth was significantly affected by the salt stress exposure (Table 2). In this trial, LYP9 had high FEP but low SEEP after 4 d and showed good emergence after that period. It means that most of the seeds emergence was occurred after 4 d (Hakim et al., 2010; Anbumalarmathi and Mehta, 2013). The reduction of final seed emergence percentage, seed emergence rate, seed emergence energy percentage, and early rice seedling growth characteristics under salt stress has been revealed because of marked effects of osmotic stress and specific ionic stress on these growth stages in LYP9 and NPBA rice cultivars (Hakim et al., 2010; Anbumalarmathi and Mehta, 2013). The changeability in salt tolerance between rice cultivars at emergence stage has been testified by Anbumalarmathi and Mehta (2013) and Hakim et al. (2010). It is also reported a delay of germination in other crops such as maize, wheat (Benderradji et al., 2010). The cultivars with higher emergence energy at specific salt level evidently would be of greater competitive advantages as compared to the cultivars having lesser SEEP value for apprehending ecological and edaphic means. The imposition of salt stress caused a reduction in poor stand density of crop plant during seed emergence stage. This effect is due to the osmotic stress under salt that decreased emergence rate (Jamil and Rha, 2007; Munns and Tester, 2008). It is also stated that in some inbred cultivar of rice, NaCl decreased a-amylase activity in sprouting seeds of rice even at low salt levels with tolerant cultivar showed greater enzymatic activity as compared to salt sensitive cultivar (Shereen et al., 2011). Table 5 The classification of rice cultivars on the basis of total dry matter production against sodium chloride. EC: Electrical conductivity, T: tolerant, MT: moderately tolerant, MS: moderately susceptible, S: susceptible, LYP9: 'Liangyoupeijiu', NPBA: 'Nipponbare', DM: dry matter. Emergence of seedling characteristics affected in both rice cultivars but LYP9 showed some resistance against salt stress even at HS (EC 4.64 dS m-1) but NPBA showed high sensitivity at this salt stress level and could not survive. The root length and shoot length is the main indicator of rice plant to salt stress. Rice plant cell division and cell elongation are significantly affected by salt stress, which results in a decline in root, leaf growth, and production (Munns et al., 2006). In this trial, the growth characteristics of rice plants such as shoot length, root length, leaf, stem, and root DM, and total plant DM production decreased due to salt stress at early seedling and maximum tillering stages by reducing turgor pressure in growing leaf tissues resulting from lowered osmotic potential in root growth medium and limited carbohydrate supply for growth necessary for photosynthesis in salt stress (Hakim et al., 2010; Anbumalarmathi and Mehta, 2013). Results about a significant decline in mean root and shoot length happened under the imposition of salt stress supported by Jamil and Rha (2007) and Jiang et al. (2010). Many greenhouse and field studies also exposed that salt stress decrease rice stand density and seedling biomass production (Lauchli and Grattan, 2007). The reduction of seedlings emergence characterizes and total DM production might be due to ionic imbalance (increase in Na+ content and decrease in K+) due to salt stress (Figure 1, Tables 2 and 3). The possible reason of this imbalance in plant tissues is direct competition of Na+/K+ at plasma membrane, effects transport of K+ by Na+ in xylem tissues or root have been stated to be the main restraints in cell enlargement as well as the key contributors to osmotic adjustment under stress conditions in numerous plant species (Hirschi, 2004). Salt stress decreased seedling height at the early seedling stage as well as at maximum tillering stage. In this experiment the seedling height reduction rate was observed at all salt stress levels from LS, to HS in both cultivars compared with CK. At heavy slat stress level, NPBA could not survive at above-mentioned growth stages. In LYP9 SHR % was significantly higher at early seedling growth stage than the maximum tillering stage at all salt stress levels. A similar trend was observed in NPBA at LS and MS. This high SHR % effects are due to ultimate osmotic stress as well as nutrient imbalance caused by salt stress which leads to a reduction of yield (Hossain, 2004). Plant dry weight decreased at different growth stages after exposure to salt stress in both rice cultivars. Relative dry weight (RDW) was calculated in this trial at the early seedling stage and maximum tillering stage. RDW decreased with increased salt stress levels in both rice cultivars. In LYP9 RDW was significantly decreased at early seedling growth stage than the maximum tillering stage at MS and HS salt stress levels. The NPBA showed a decreasing effect at LS and MS level. But NPBA died at HS level. Collectively LYP9 showed better resistance against salt stress than NPBA. These decreasing effects are due to the reduction of total chlorophyll contents (SPAD value) with augmented salt stress levels. Consequently, plant dry weight declined due to a decrease of chlorophyll content under salt stress (Islam et al., 2007). Plant height and dry weight of various rice lines revealed a deteriorating pattern with the imposition of salt stress levels (Hossain, 2004). Salt stress also affected the plant physiological characteristics in this study. Salt stress decreased many physiological traits in rice plant, such as a decrease in Pn, Tr, RH-S, gs, and Ci. Moreover, chlorophyll contents (SPAD value), in rice leaves are damaged by the addition of Na+ and Cl-, which might hinder the major electron transport in photosystem II (PSII) (Cha-umi et al., 2009), found that chlorophyll contents in rice leaves were significantly decreased after imposition of salt stress. Generally, Pn, Tr, RH-S, gs, and Ci reduced with augmented salt stress in both rice cultivars. This response is due to the closure of stomata and mesophyll conductance inhibition results in reducing atmospheric vapor and leaf turgor pressure (Parihar et al., 2015; You et al., 2016). The Pn, Tr, RH-S, gs, Ci, and SPAD plays key role in rice plant growth and development, and these physiological traits in rice leaves are impaired through the addition of Na+ and Cl- which seem like to the effects the bioenergetics mechanism of photosynthesis, which may obstruct the major electron transport in PSII essential for photosynthesis activity in plant (Madana et al., 2014). The decreased Tr and gs may be one of the key adaptive tools of salt sensitivity and tolerance in rice (Cattivelli et al., 2008). The Pn, Tr, RH-S, gs, Ci, were dropped to different salt stress levels. The decline of photosynthesis activities of salt-tolerant cultivars was less than salt sensitive cultivars (Akram and Ashraf, 2013). The current results showed that these characteristics affected less in LYP9 as compared to NPBA due to its susceptibility to salt stress. The reduction of a number of tillers is common during salt stress in the plant. A number of tillers significantly reduced in both cultivars under all salt stress levels (Figure 5). LYP9 showed low number of tillers reduction rate as compared to NPBA. Tillering dynamics were significantly affected by MS and HS stress level than CK in LYP9. At HS the NPBA seedlings could not survive. This difference is directly linked with chlorophyll contents (SPAD values), and photosynthesis activities in rice leaves. The results in a reduction of the C assimilation and biomass production due to osmotic stress and ion imbalance high Na+ and Cl- in soil and plant tissues under alt stress (Akram and Ashraf, 2013). From the results of all parameters, we categorized both cultivars against salt stress. On the basis of growth, SHR %, RDW, and total DM production, LYP9 is susceptible to salt stress at HS stress level and NPBA could not emerge and normal rice seedlings completely died at this salt stress level. 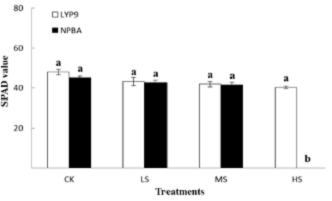 Generally, LYP9 showed resistance to salt stress than NPBA at all stress levels. These results prove that salt sensitivity varies from species to species, and varies at different stages. In the same way, Fageria (1985) classified rice cultivar based on DM production of the plant. It was concluded that seedling emergence or early seedling growth of two different rice cultivars were inhibited by increased salt concentration. The seed of 'Nipponbare' (NPBA) could not emerge at heavy salt stress level compared with 'Liangyoupeijiu' (LYP9). Also, seed emergence rate, seed emergence energy percentage, and final emergence percentage of LYP9 were higher at low salt stress (LS), medium salt stress (MS), and heavy salt stress (HS) salt levels than NPBA. The physiological traits reduction was less in LYP9 than NPBA. Based on the efficiency of early seedling total DM, reduction of the LYP9 was less compared with NPBA at all salt stress levels from emergence or early growth to maximum tillering stages. At the early seedling stage, LYP9 was classified as a salt tolerant to moderately susceptible rice cultivar. However, NPBA was categorized as a tolerant, susceptible, and sensitive rice cultivar at LS, MS, and HS levels. At maximum tillering stage we categorized cv. LYP9 on the basis of total plant DM as moderately salt tolerant (MT), moderately susceptible (MS), and susceptible (S) at 1.5, 4.5, and 7.5 g NaCl kg-1 soil salt levels. While NPBA was classified as MT, S, and sensitive at LS, MS, and HS salt stress levels at the maximum tillering stage. This study will help us to provide new ideas for improving the high yielding rice cultivar (LYP9) to salt tolerance by genetic improvement and cultivation techniques. This work was supported by Natural Science Foundation of Zhejiang Provincial, China (LY16C130007), National Key Research and Development Program of China (2016YFD0200801), and Basic Research Foundation of National Commonweal Research Institute (2014RG004-5).